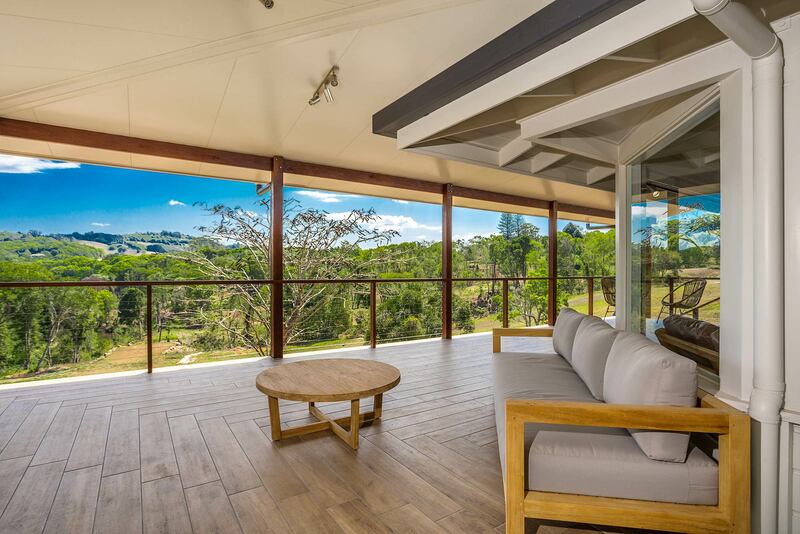 Imagine a relaxing holiday at Rockinghorse House - a recently renovated and styled 4 bedroom, 3 bathroom holiday home with additional loft, nestled on a sprawling 70-acre Hinterland property in Coorabell, just 20 minutes from Byron Bay. 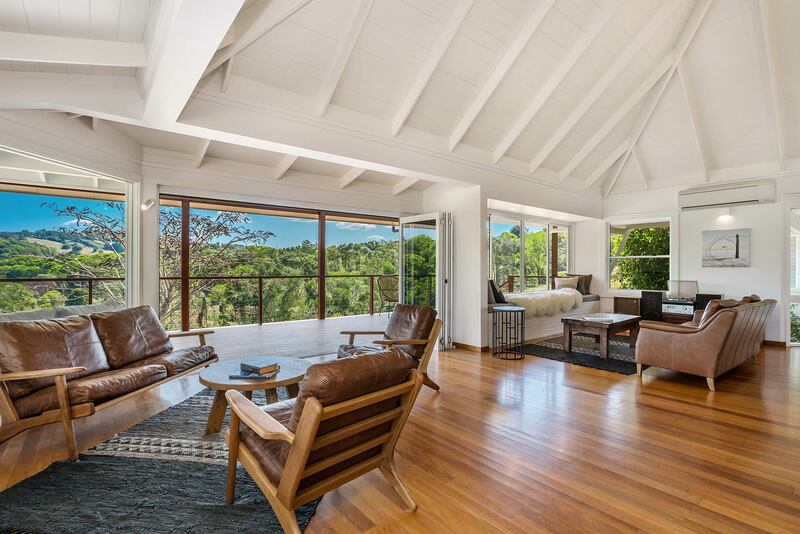 Luxuriate within this Hinterland hideaway, which features maximum glazing for ample natural light and endless access to spectacular Hinterland views. 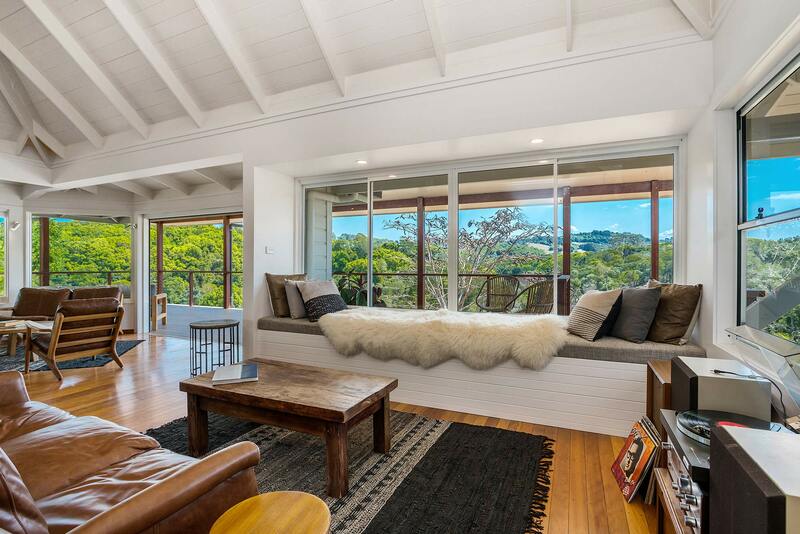 Modern and stylish, Rockinghorse House has exposed sloping ceilings, polished timber floors and high-end contemporary furnishings and decor. 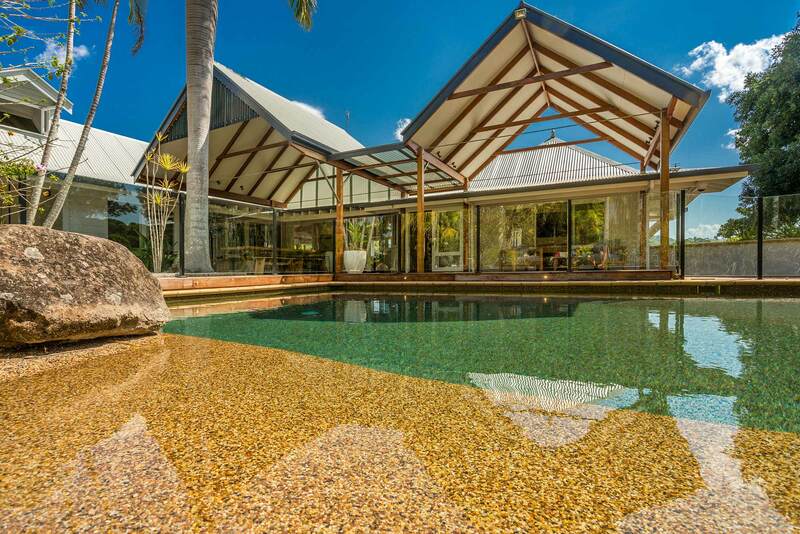 This stunning home is spacious and open, designed in a wrap-around style, with the resort-style pool, tropical gardens and outdoor entertaining areas the central feature. Four light-filled bedrooms, dual living spaces and an additional loft space serving as a kids retreat/bedroom, offer many options for families and groups. 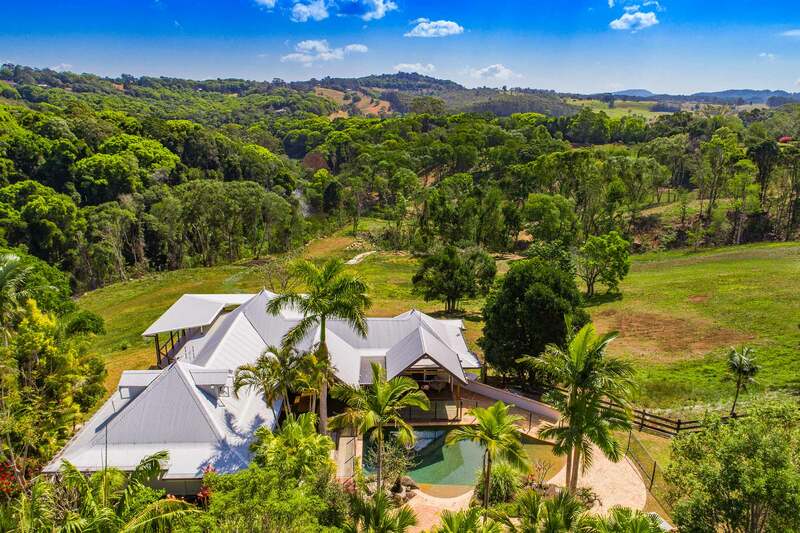 Surrounded by boundless backyard of the Byron Hinterland, this 70-acre property gives guests room to roam, with a large flat lawn as well as bushland and natural waterways. Holiday like a rockstar at Rockinghorse sharing meals within the covered entertaining space overlooking the pool or relax on high-end outdoor lounges on the balcony, drinking in the Hinterland views. 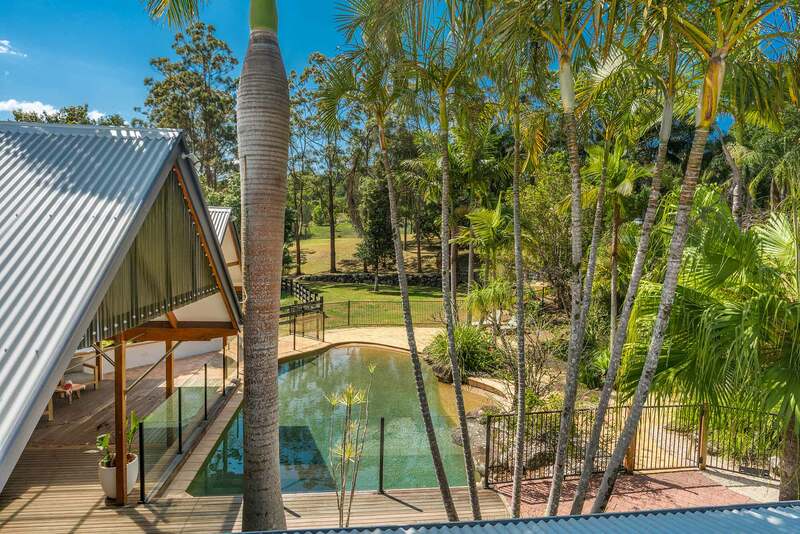 From Rockinghorse House, drive to Byron Bay in 20 minutes or take a short 3km drive to local Federal Village. This stunning holiday accommodation shares the entrance way with the iconic Rockinghorse Studios, a private and full state-of-the-art recording studio for local and international bands, located next door. Smart design and full sound-proofing ensures guests have privacy and seclusion, with completely separate accesses, opposing outlooks and privacy screening. Rates can be negotiated for guests wanting to rent the complete property or just the recording studio space. 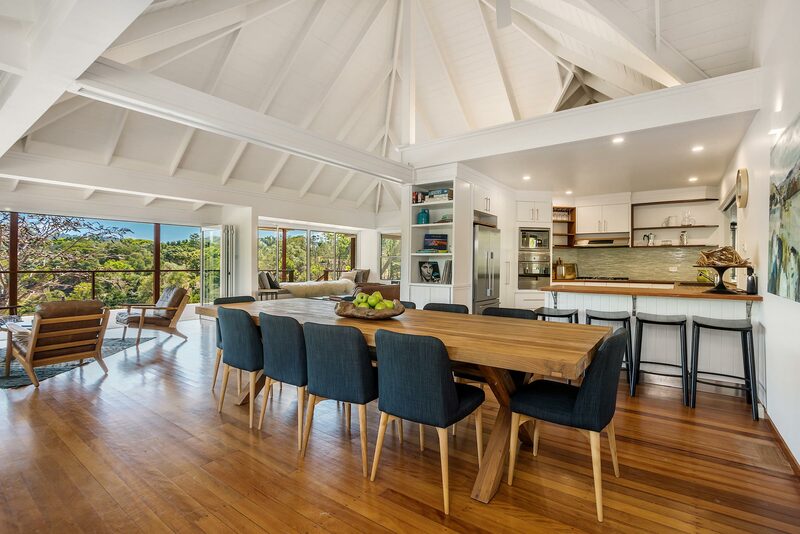 Light-filled and airy, the open-plan living and dining space features a sitting room area with designer leather armchairs and sliding doors opening to the large rear outdoor veranda. The flowing space extends into another living area where guests can relax on the leather sofa, bask in sunlight on the stunning feature window seat, or listen to vinyl records on the record player. 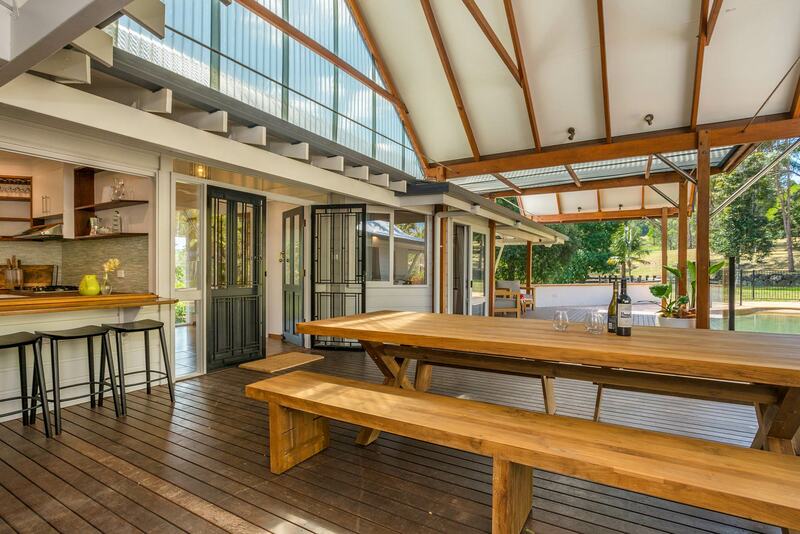 Share meals beneath the Hinterland views in the sun-drenched dining space with contemporary 10 seat timber dining setting. 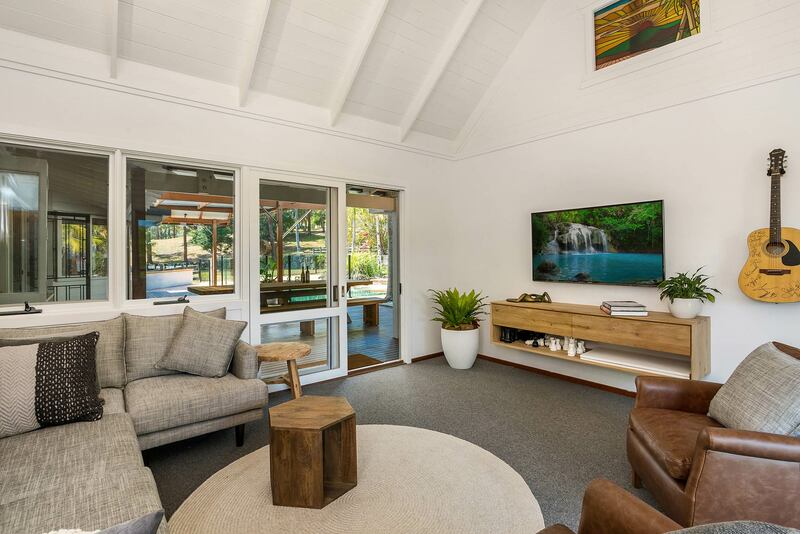 An additional living/media space comes complete with modular sofa and leather armchairs, flat-screen TV with Netflix and access to the front outdoor living space and pool area. 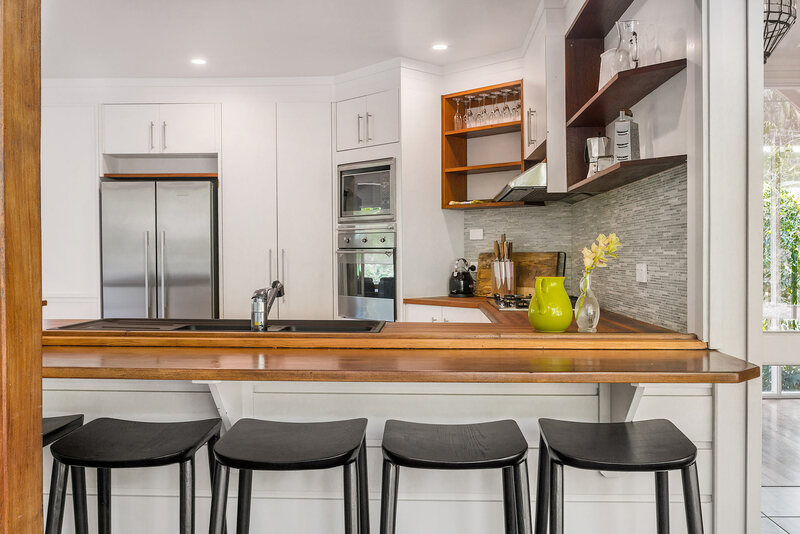 Cooking is easy with the spacious entertainer’s kitchen featuring ample space, timber benchtops and high-end stainless-steel appliances. 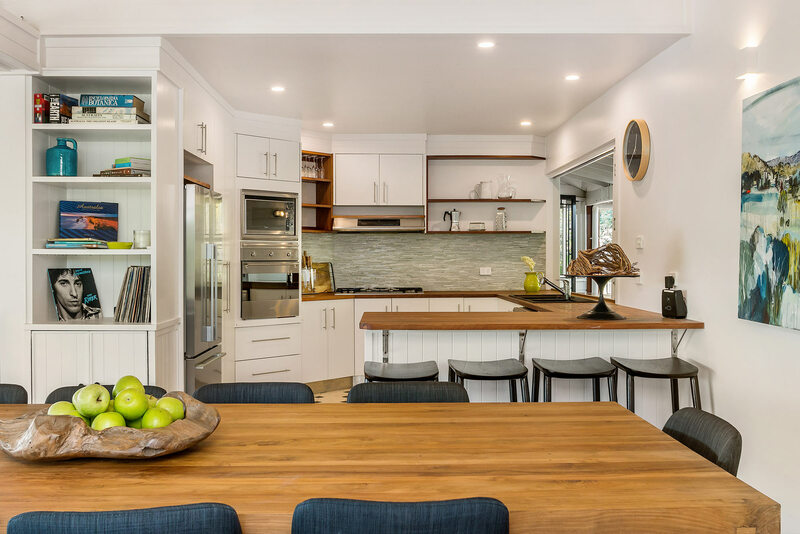 Entertain in rockstar style, with a4-seat capacity breakfast bar that adjoins the indoor dining area, and a stunning servery that opens to the outdoor dining area with views of the pool and Hinterland beyond. 4 stunning and spacious bedrooms are decked out in simple, elegant style, with ample natural light and plush soft furnishings. All bedrooms open out to the front outdoor entertaining and pool area and the master bedroom includes an ensuite bathroom. 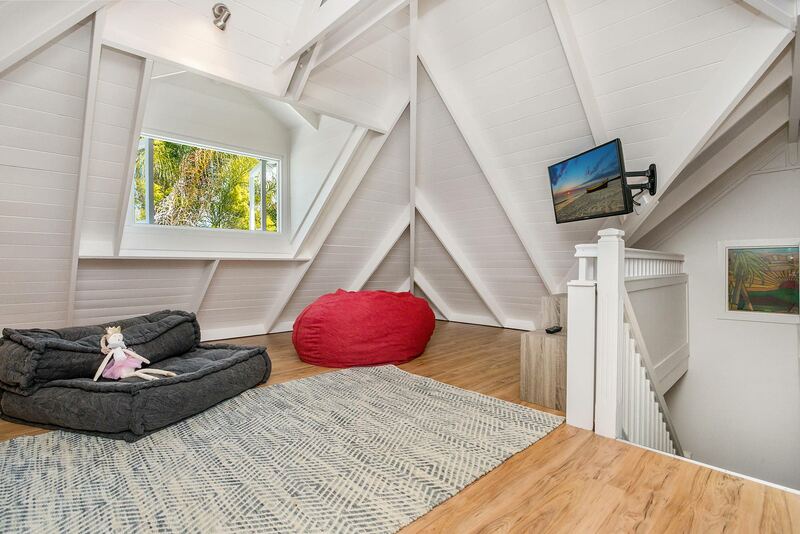 Kids can relax in the dreamy, light-filled loft space, that serves as a rumpus room or extra bedroom and features exposed sloping ceilings, kids comfy bean bags that double as beds and a wall mounted flat screen TV. 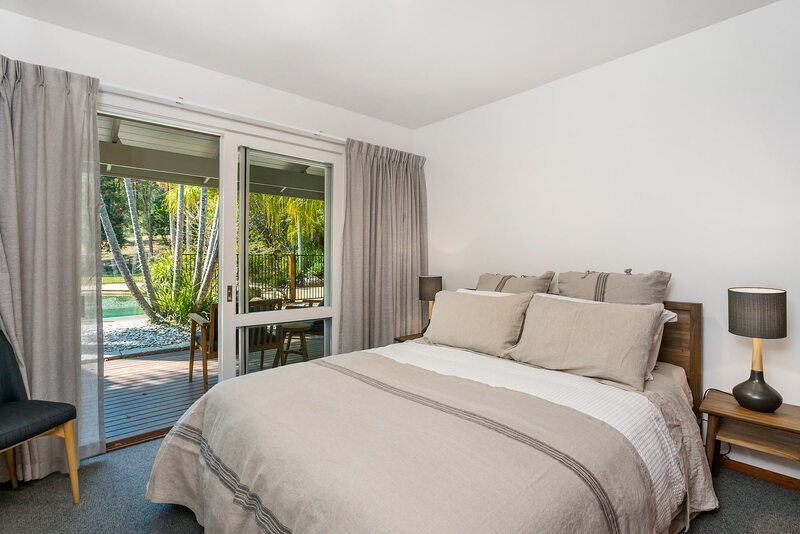 Rockinghorse House has 3 bathrooms in total - one main guest bathroom plus bath, an ensuite bathroom off the master and an additional separate toilet with vanity and power points. 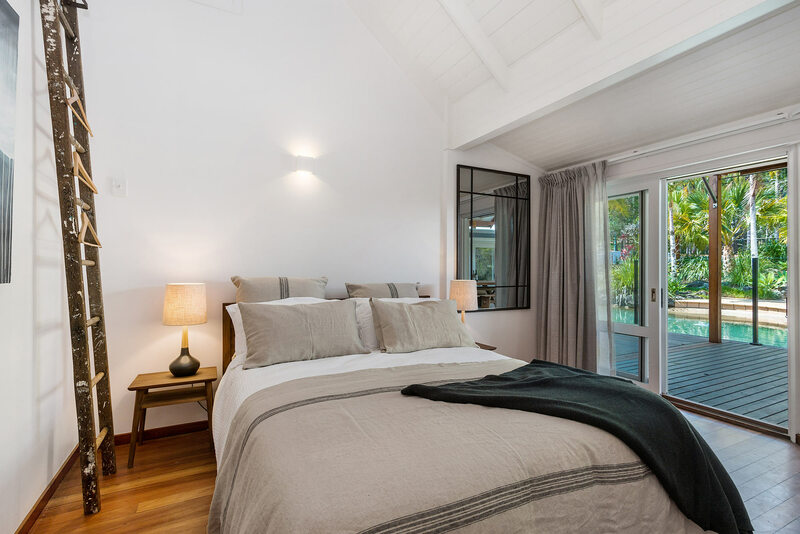 The bathrooms are modern, resort style and minimalist with frameless glass open shower space, frosted and louvered windows, timber vanities and one deep freestanding bath with amazing views. An entertainers dream, guests can make sweet holiday memories in the Rockinghorse House outdoor spaces. 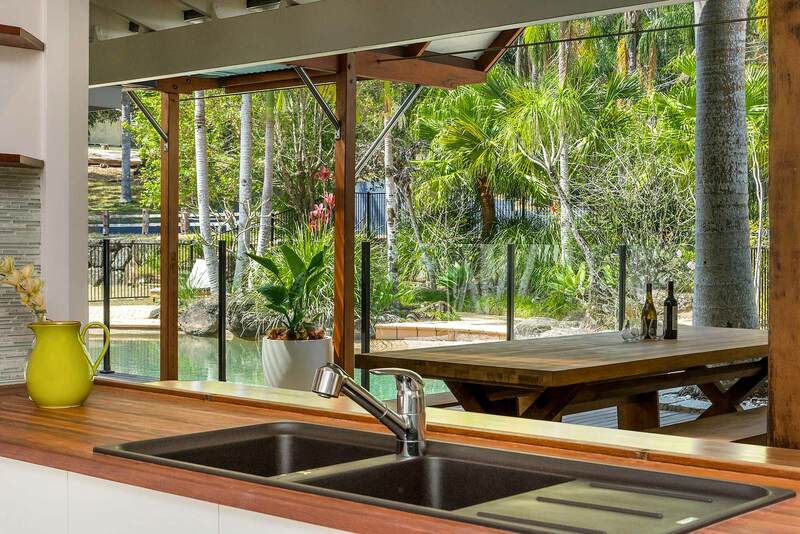 This stunning holiday home wraps around a large and spacious covered outdoor entertaining area, all accessed from the 4 bedrooms, the living space and the kitchen servery. 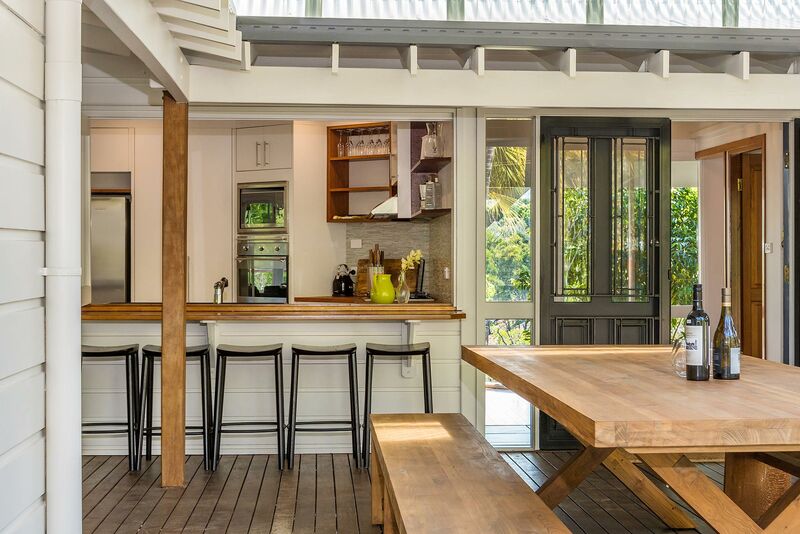 Enjoy long lunches and delicious dinners at the large timber outdoor dining setting while looking out to the pool, tropical gardens and Hinterland expanse beyond. An additional expansive veranda space is provided to the rear of the house to allow privacy for large groups and can be accessed from the sitting room. 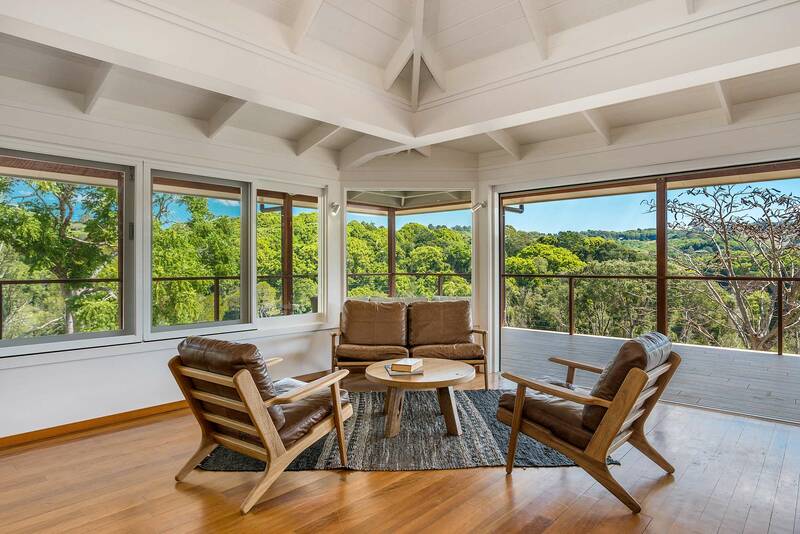 Relax on the outdoor lounge and soak in the rolling views of the rear of the property down to the creek and beyond. 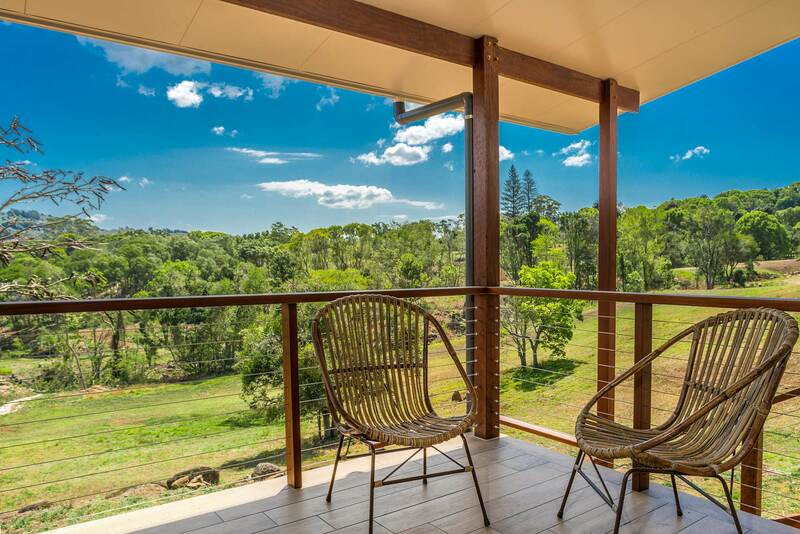 Relish in Rockinghorse House’s wide-open spaces and explore the 70-acre Hinterland property, complete with creek, swimming hole, bushland and native wildlife. The kids will love the large flat lawn, perfect for playing on the long Byron summer days. The central outdoor feature of Rockinghorse House is the stunning, private inground pool, framed by tropical gardens and the lush, green Hinterland beyond. 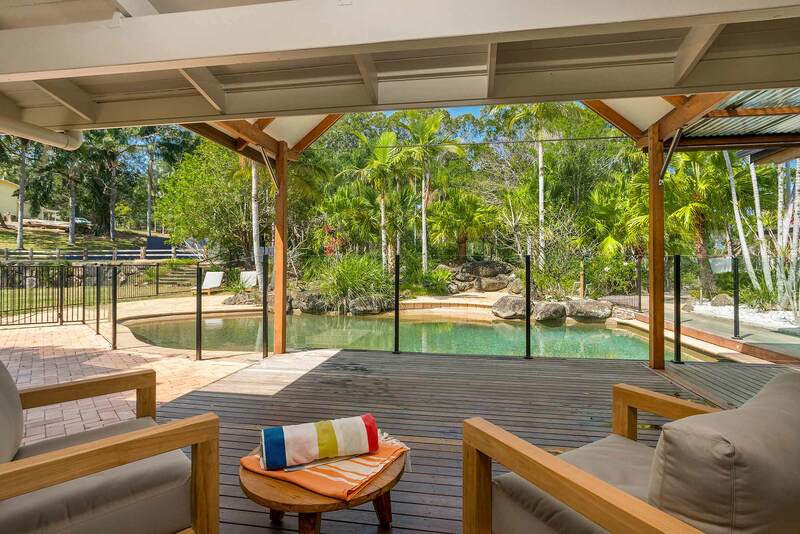 Sit poolside on luxury loungers on the covered timber deck area. Rockinghorse House has reverse cycle air-conditioning in both living spaces, as well as ceiling and pedestal fans in the bedrooms. The property is shared with Rockinghorse Recording Studios, which can also be booked both separately or together with the accommodation. From time to time, the recording studio will be booked by clients while guests stay in the holiday home but rest assured, separate accesses and soundproofing guarantees ultimate privacy and minimal disruption. Rockinghorse House can also accommodate the right pet (on application) so guests can share their holidays with their furry friend but please be mindful that the property is not fenced so owners bear full responsibility for their beloved pet. 4 off-street carparks are provided for Rockinghorse House guests. Additional parking is provided for guests of the Rockinghorse Recording Studio. 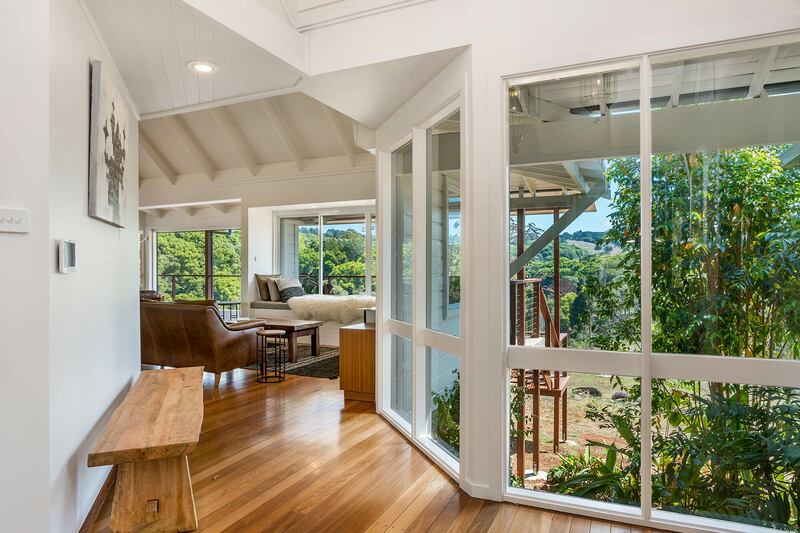 This stunning holiday home is located in the beautiful Byron Bay Hinterland, in Coorabell, along the Coolamon Scenic Drive which is known for its amazing views across green, grazing farmland to the spectacular coast. In less than 3kms, guests can visit Federal Village, a charming country hamlet with restaurants, general store and easy access to world famous rainforests and National Parks such as Minyon Falls, Nightcap National Park, Protester Falls and Mt Warning. From Coorabell, drive only 20 minutes to reach the centre of Byron Bay. *Please note that this property is also home to Rockinghorse Recording Studios, which is totally separate from the main residence and has its own access. From time-to-time there will be clients accessing this studio, however, the studio itself is soundproof and will not cause guests any disturbance. Favourite experience: Sitting around the pool and watching the sunset on the deck. Amazing house!I would like to say thank you very much for all your assistance, I work in real estate myself and the communication from all your team was amazing. Definitely would use you again and would be happy to refer you to friends. Enjoyed not having to go anywhere, The house and property were amazing and we thoroughly enjoyed being away from it all, having the space and facilities to relax, cook, swim, explore and enjoy nature in peace and quiet.